Rock n' soul will rule the night as Christine Ohlman, the flashy, gritty platinum-blonde "Beehive Queen," who is the longtime vocalist with NBC's Saturday Night Live Band, returns to the WC Handy Festival for the second year on Thursday, July 26 for an 8 pm dance concert (with opener at 7 pm) at the Marriott Conference Center in Florence to benefit the Muscle Shoals Music Association (MSMA). Ohlman will be joined by Alabama Music Hall Of Fame Achievers The Decoys in a show that will pay tribute to the music of The Shoals while spotlighting songs from her six CDs, including The Deep End, a passionate collection that garnered five end-of-year 2010 national Top Ten mentions (Rolling Stone editor emeritus Dave Marsh said,"There are so many 'wow' moments," and esteemed journalist Peter Guralnick weighed in with, "Tough, tender, thoughtful and sassy; R-E-A-L, as Sam Phillips was wont to say"). Ohlman, who has been called "The Number-One Secret Weapon in America's gal-singin' sweepstakes" by the All-Music Guide, will be joined onstage by The Decoys (Kelvin Holly-guitar; Scott Boyer-guitar/vocals; David Hood-bass; Mike Dillon-drums; NC Thurman-keys) in serving up a night of love-drenched stories with a Muscle Shoals twist in a style Dave Marsh has dubbed "Contemporary Rock R n' B." Special guests will include legendary Sun Records drummer James "JM" Van Eaton. Ohlman's shows are legendary for their powerful musicianship and raw emotion. She is a consummate singer who's gone heart to heart with the best: she counts Al Green, George Harrison, Mac Rebennack, Sting, Ian Hunter, Bonnie Bramlett, Ronnie Spector, Charlie Musslewhite, Irma Thomas, Chrissie Hynde and the late blues giants Hubert Sumlin and Eddie Kirkland as but a few of those she has collaborated with on Grammy-nominated recordings and live appearances like Bob Dylan's Madison Square Garden 30th Anniversary concert. This queen of blue-eyed rock n' soul, who grew up loving equally the sweetness of a Memphis horn line and the raunch of an electric guitar riff--whether played by Muddy Waters, Keith Richards, or Pop Staples--teased her blonde hair into a beehive in honor of Ronnie Spector and never looked back. The Deep End includes duets with Dion, Marshall Crenshaw and Ian Hunter (she appears on Hunter's new CD and joined him recently at Carnegie Hall) and guest turns by Big Al Anderson, Levon Helm, GE Smith, Catherine Russell, and others. the 2012 Rock n' Roll Hall Of Fame Induction Ceremony; 2012 Carnegie Hall Tribute To The Rolling Stones; The Lincoln Center “American Songbook” series with Sting, Lou Reed and Van Dyke Parks; two 2011 "evenings of duets" with Mac Rebennack; the Central Park Summerstage Tribute To Janis Joplin (where she fronted both Big Brother & The Holding Company and the Kozmic Blues Band); appearances on Grammy nominees A Tribute To Howlin' Wolf (with Taj Mahal and Lucinda Williams) and Charlie Musselwhite’s One Night In America (with Marty Stuart); recent live shots with Americana stalwart Paul Thorn and New Orleans legends The Subdudes (she joins The ‘Dudes, BB King, Richard Thompson and others on the CD Get You A Healin’ to benefit the New Orleans Musicians’ Clinic, Ohlman's charity of choice); and headliner slots at the 2010 and 2011 New Orleans Jazz & Heritage Fest’s “Down On The Bayou" series with Irma Thomas and others. In addition, she is a musicologist of note, who edited legendary Rolling Stones producer Andrew Loog Oldham’s autobiography 2Stoned and is a cover-story-writing contributor to Elmore Magazine. Ohlman has stories from her long tenure at SNL. She witnessed both the Sinead O'Connor ripping-of-the-pope's-picure and Jessica Simpson "meltdown" incidents, and calls Jimmy Fallon's December 2011 hosting, where all of his 2003 cast members returned to join him, "a delight." Her 2011 WC Handy appearance at Swampers and a show-stopping duet with Bonnie Bramlett during a Decoys' appearance at Crocodile Ed's earned her a return spot at this year's festival. "Love Make You Do Stupid Things" from The Deep End is often heard on WQLT, Q-107, and Ohlman will join Jimmy Oliver on his morning radio show on Wednesday, June 25. She promises an incendiary evening at the Marriott. "I'm a lifelong fan of the music and musicians of Muscle Shoals," said Ohlman recently. "It speaks to me deeply. To be asked to perform in a benefit dance concert for MSMA is an honor, and I am so grateful for the many new friends I've made." 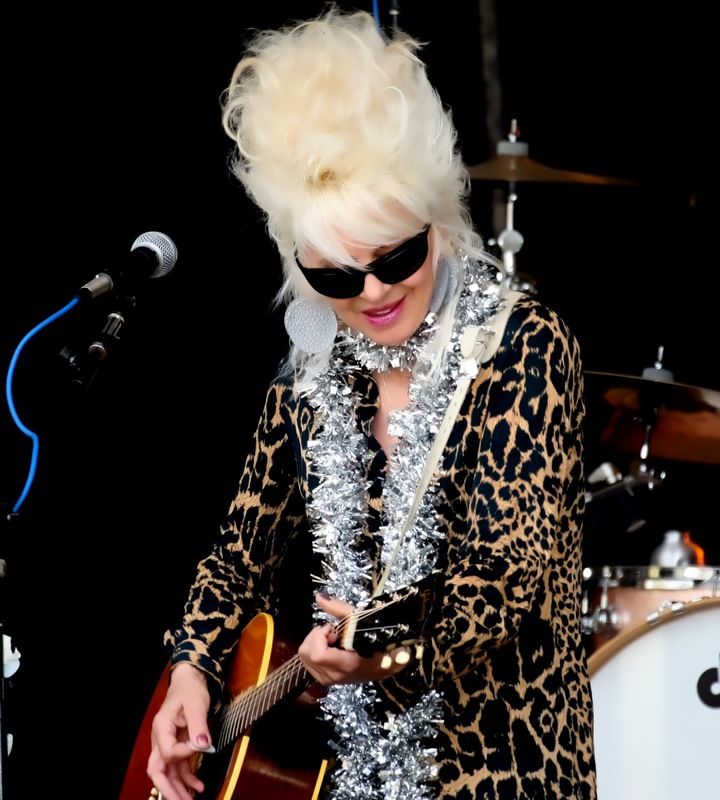 Of Ohlman's stage persona, one critic wrote, "From the mile-high beehive hairdo to the textbook rock n' roll radio lungs, Christine Ohlman reminds you of what used to be great about rock before it began to think too much. Watching her wind between roots rock and blues and never lose control of the wheel was a thrilling, reassuring sight." "I've come here tonight to set your souls on fire," The Beehive Queen has been known to tell an audience. And on July 26, she will. The Marriott Conference Center is located at 800 Cox Creek Pkwy S., Florence. Tickets are $10.